My favorite browser and email programs at the moment are Mozilla Firefox (v. 1.5) and Thunderbird (v. 1.0.7). Both of them are free and very compact in size, so you won't have any problem downloading them at all. Now I can use my Gmail email account with Thunderbird. Pretty cool!One of the coolest extensions for Firefox is the Web Developer Toolbar. It adds a menu and a toolbar to the browser with various web developer tools. 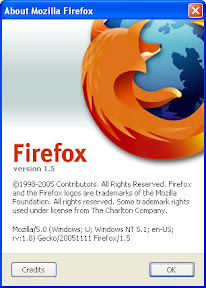 It is designed for Firefox, Flock and Mozilla, and will run on any platform that these browsers support including Windows, Mac OS X and Linux. If you are a web developer like myself, you should definitely get it.